There were a ton of storylines on display at the final table of the WPT’s Bay 101 Shooting Star event this week. It was the second consecutive final table for Vivek Rajkumar, who finished second at the LAPC and put on quite a display during this California swing of the World Poker Tour. Mike Matusow made his way to his fifth WPT final table, still seeking a win that has thus far eluded him in his career. But the biggest story of them all was that, for the first time in the history of the WPT, Mike Sexton would not fill the seat in the broadcast booth next to Vince Van Patten. It wasn’t a coup by Tony Dunst, though it wouldn’t be out of the realm of possibilities for Dunst to try something like that, but rather for the first time ever, Sexton made the final table of a WPT event and was unable to fulfill his broadcasting duties. The story would not have a happy ending, however, as Matusow took cards that were not quite live and turned them into monsters, eliminating Sexton by catching a jack as a 3-1 dog and knocking him out in 6th, collecting his $5k Shooting Star bounty and leaving himself as the only player with that target on his back. Rajkumar would bow out in fourth place to conclude his impressive run, while Matusow would find himself short-stacked before going out in 3rd place. Allen Sternberg would claim the final $5,000 bounty for knocking Matusow out, and that win would propel him to the chip lead. Sternberg outlasted Steven Kelly with a timely two-outer on the river, winning the Bay 101 Shooting Star and the $1 million first place prize. The second biggest prize of the week comes from a somewhat unlikely source. The Italian Poker Tour is one of PokerStars’ regional poker tours, but it’s latest stop, technically not in Italy but on their border with Slovenia, generated a prize pool of almost €800,000. 395 players put up €2,000, and the first place purse ballooned to over €200,000. It remains to be seen whether Mustapha Kanit can be considered a “local” champion, considering the event didn’t happen on Italian soil, but the Italian player bested Marco Mancini to claim the IPT Nova Gorica title. 2009 Heartland Poker Tour Player of the Year Jeremy Dresch made history by being the first player to capture two HPT titles. It was made all the more impressive by the fact that he captured those titles in consecutive weeks. Dresch now holds the distinction of being the first to three titles, winning the HPT stop at the Shooting Star Casino in Minnesota. 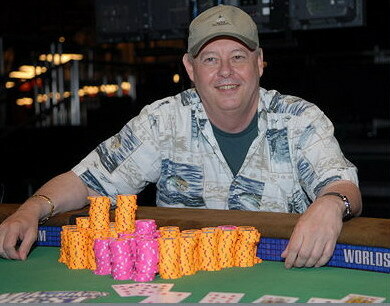 He takes home almost $50,000 after besting the field of 170. Last month on the LAPT, the hearts of thousands of Brazilians were broken when they failed to crown their first Brazilian LAPT title in Sao Paolo, Brazil, despite the volume of Brazilian players in the field. The champion was, in fact, a Chilean, and the Brazilians returned the favor this week when Murilo Figueiredo took home the win in Viña del Mar, Chile. Figueiredo defeated 620 other players in the largest LAPT field ever to win $146,000. There’s not much to be said about this tournament that wasn’t said by Dan. So I’ll just let this tournament recap, as well as these other articles he wrote explain what happened this past weekend at ZyngaCon. The Wynn has pretty quietly been running a successful poker series the last couple of weeks, and more recently with buy-ins in the $2k-$5k range they’ve drawn in quite a few poker pros living locally. The best story has to be the victory of Chad Brown; after undergoing surgery recently to remove a large tumor, Brown showed up at their most recent $2,000 event and won the whole thing, banking almost $75,000. Also winning this week was Bryan Micon, who took down the $500 HORSE event. For those who missed it live yesterday … this week’s episode employs a slimmed down cast with just me and Gary Wise, which is kinda like the difference between The Beatles and Wings, but still … with BJ, Parvis, and Ringo off on other ventures, Gary, Huff, and I break down in nitty-gritty detail whether or not Vivek Rajkumar is just a flash in the pan, the $10k field sizes of Bay 101 vs. the Wynn Classic, Dream Team Poker, and Greg Raymer’s ambassadorial efforts on behalf of the PPA. But really, I probably shouldn’t be saying this, but you can skip all that and just listen to the last few minutes for Joe Stapleton’s “Tight Laydown” … I’m starting to believe more and more that the whole “show” we poker journos do really is just an elaborate set-up for the real show, which starts somewhere around the 58th minute. A recent player bashing discussion has evolved on the 2+2 forums regarding tipping dealers and tournament staff upon winning a major event. Specifically, this is in reference to Brandon Cantu’s recent World Poker Tour $1 million win at the Bay 101 Shooting Stars tournament. Evidently, unlike many tournaments on the circuit, Bay 101 didn’t take anything from the buy-ins to tip the staff, but Brandon was unaware of this. CardPlayer has done an interesting two-part article, which includes some words from Brandon and TD Matt Savage. 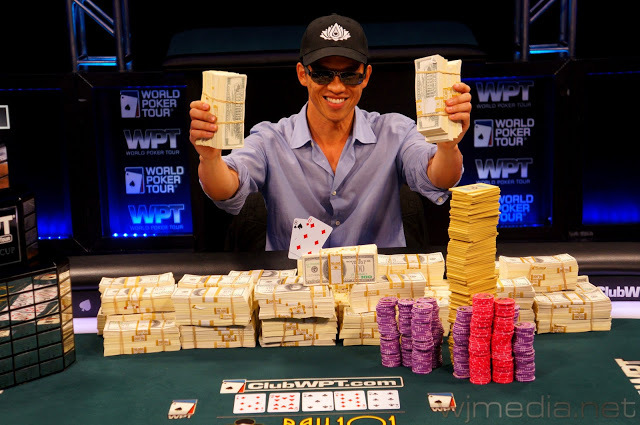 So many interesting questions arise from this discussion, as they did when Jerry Yang won the 2007 WSOP main event. Should the players be told up-front about the tipping policy at that particular venue? Is it the players’ responsibility to find out or that of the tournament director to inform everyone? If a tip is taken from the buy-ins, should players still tip on top of that? Do only the winners tip? Or should everyone at the final table tip? What is the correct percentage to tip? This is a subject that should be discussed in length. I’d love for some tournament pros to weigh in on this. The WPT Bay 101 Shooting Star main event wrapped up late last night in San Jose, California. The player who walked away with the $1 million prize and his first WPT title was Brandon Cantu. This tournament is always a unique one, with bounties on numerous pro players worth $5k each, and $10k bonuses for the chip leader at the end of Day 1A, Day 1B, and Day 2. Players typically enjoy the unique aspects of the game, and the fans can’t get enough. There are fans everywhere seeking autographs, photos, and a glance at the pros in action. Phan was the first to go, followed by Baker and Jefferson. The lovely Jen Harman put up a solid fight but finished in third. By the time heads-up action began, Cantu had over 6 million chips to Sung’s 1.3 million. It didn’t take long for Cantu to seal the deal. Cantu had a stellar tournament. Not only was he the Day 1A chip leader for a $10k bonus, but he ended up collecting six bounties throughout the event for an extra $30k. And in the end, he maintained his final table chip lead, which is an usual phenomenon these days, and took the WPT title and cool mil. He is now one of the elite group of players to have won a WSOP bracelet (2006 $1500 no-limit hold’em) and a WPT tourney.